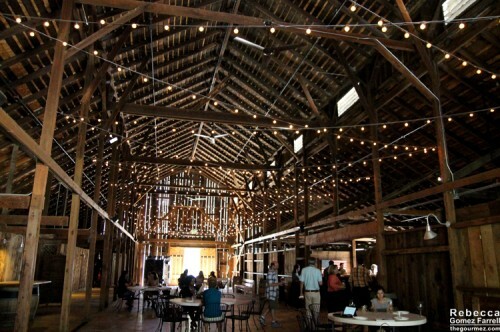 Home / Events / Oak Farm Vineyards Winery Expansion! 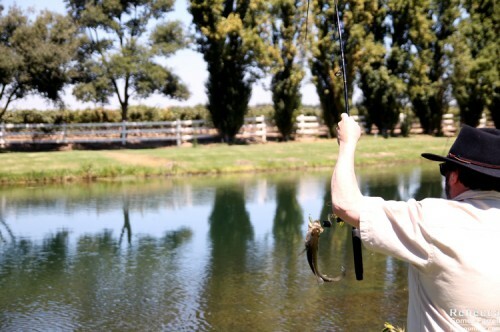 The fishing lake at Oak Farm Vineyard. Click twice for the full view. 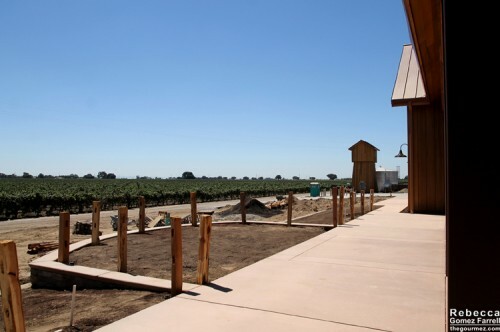 Oak Farm Vineyards Winery (23627 Devries Road) is on its way to becoming the first of its kind in the Lodi, CA, appellation: a family-owned estate that offers the full experience of a large-scale destination winery, minus the glitzy hotel and pretension. I took part in a media preview of their new expansion, which will help them achieve that goal. 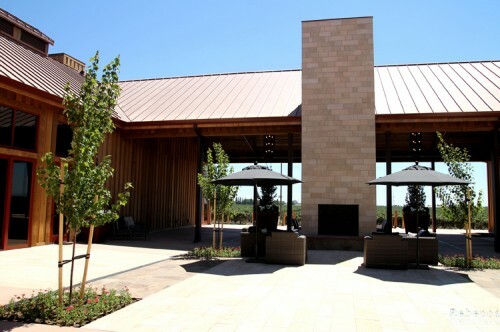 The Wine and Hospitality Facility is scheduled for a public grand opening on October 25 and 26 of this year, and if you’re a local wine lover, it’s an event you shouldn’t miss. 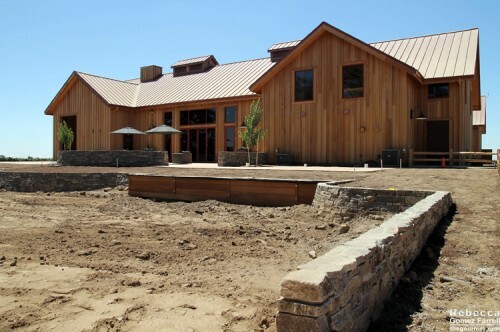 That beautiful wood-covered tasting room is the centerpiece of the expansion. By now, the landscaping is likely all filled in along the terraced stone wall. Inside, the tasting room is covered in more gorgeous wood and decorated with an inviting modern aesthetic. That geode picture is really for my sister, who collects them. 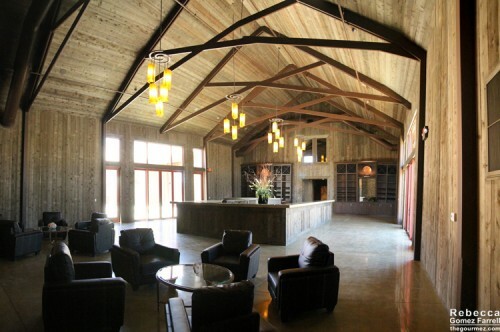 Attached to the tasting room is a bonus room that is intended for the use of Oak Farm Vineyards wine club members. Dorothy Panella, mother of Managing Partner Dan Panella and Business Manager Nicole Panella, is officially in charge “of stuff,” which included decorating the room before us bloggers rolled in with our cameras. She assured us that the final version of the room would look much better, but frankly, I think she did a great job with the stuff. 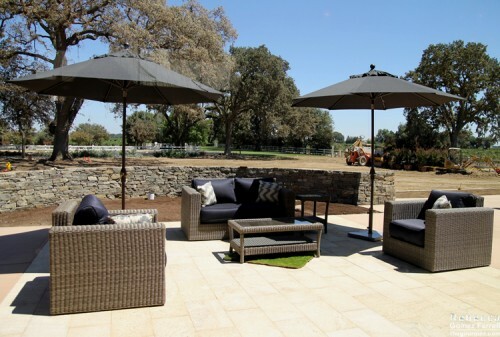 The bonus room is only one of many options guests at the winery will have in the new facilities. What I enjoyed most about them is how many cozy spots have been created within what could be a cavernous space. Seating area on the other side of the double fireplace. View of the water reserve silo from the patio. Those cozy spots aren’t limited to the new expansion. 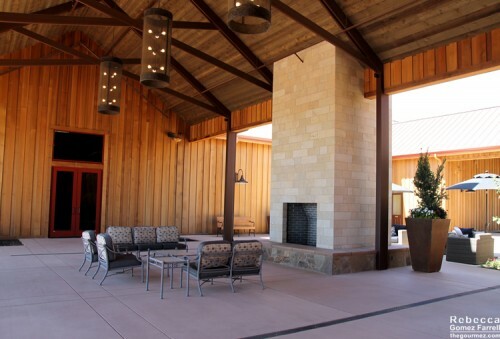 As we discovered when we headed over to the older buildings on the 70-acre grounds, Oak Farm Vineyards Winery has long offered a bevy of beautiful locales for enjoying their wine and whiling away an afternoon. 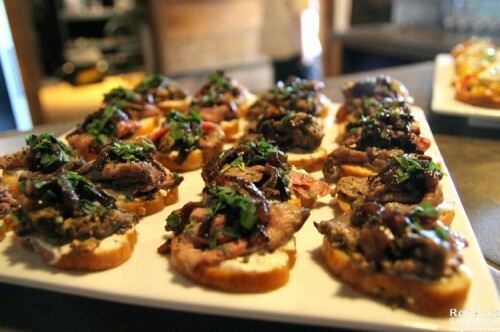 A tasting of their wines and sampling of appetizers, all complimentary along with our tour (disclosure! ), commenced in their historic redwood barn. 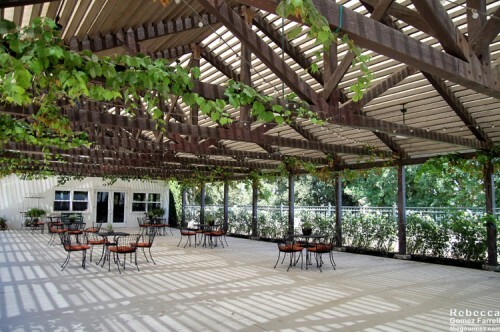 Don’t forget the patio arbor leading to the former public tasting room. 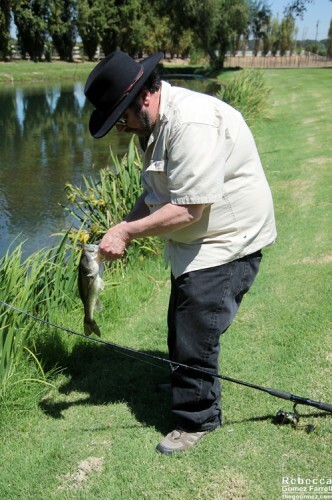 Or the lake where guests can catch and release fish or simply enjoy some wine picked up at the tasting room. Peter Nowack, fellow wine blogger, demonstrated that particular activity for me. As I mentioned, the media preview included a tasting and appetizers. I would be a sad food blogger not to note that the catering offered by Lodi’s Airport Café was delicious, especially the two crostini options. Tenderloin with blue cheese and caramelized onions. 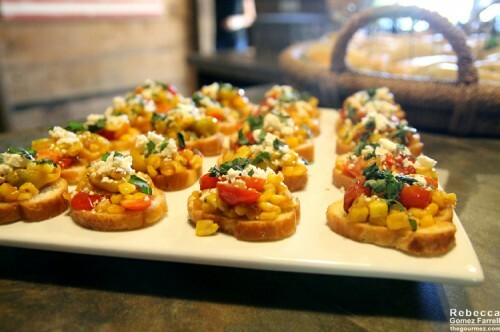 Blistered cherry tomatoes with caramelized corn and goat cheese. That caramelized corn needs to be in everything ever. 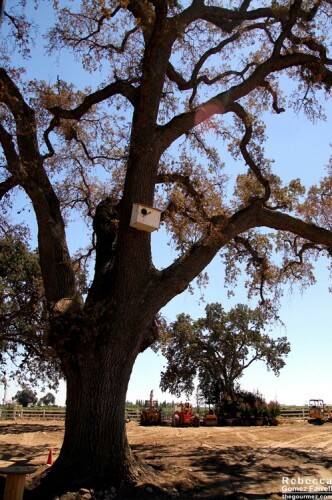 As for the wines, Oak Farm is remarkable in California for growing an equal amount of white and red grapes. All of their wines are made solely from their vineyards on the estate. The sultry Verdelho 2012 would be ideal for hot summer afternoons by their lake, and the 2012 Dolce Blanc, a sweet gewürztraminer, is like finding a cool, shaded bench at the boardwalk with its smooth mead-like honey notes and hint of the sea. However, the 2012 Chardonnay impressed me the most. As the tasting notes describe, it’s full of tangy acidity, but I also enjoyed the presence of anisette wafer cookies and the subtle oak that contributed to the wine’s complexity. My overall thoughts? Walking down a gravel path with bunnies crisscrossing before you. Think I’d recommend visiting Oak Farm Vineyards Winery? You’d think correctly! Don’t forget, the grand opening of the new facilities takes place on October 25 and 26. One of the many oaks from which the vineyards take their name. Want more pictures of the grounds before you commit? Peruse my Facebook album here for the full set, including pictures of their new grape pressing equipment and storage rooms and the estate’s manor house. 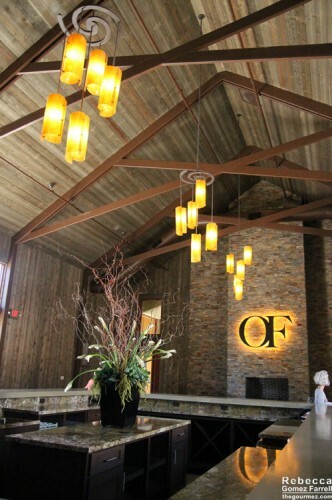 6 thoughts on : Oak Farm Vineyards Winery Expansion! 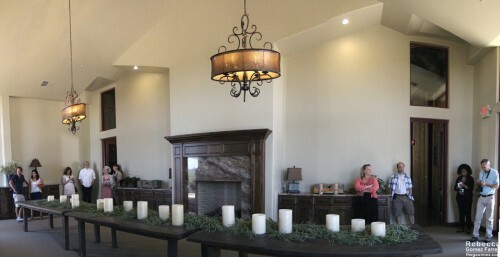 Wow, what a beautiful event and new tasting room! I was there when the plans for this new place were just being done, so I keep meaning to get there and see it but haven’t had a chance yet. Your article describes the way my husband and I felt the first time we stopped in for tasting. The best part..still feel that way after many visits(wine club members)! I love the relaxed vibe they have captured. Needless to say, the wine is the best attractor. The new facility is beautiful and look forward to many cozy visits this winter. CinCin Salute! It has been a joy to experience 3 years of wonderful progress and the birthing of a wonderful new addition to the region. 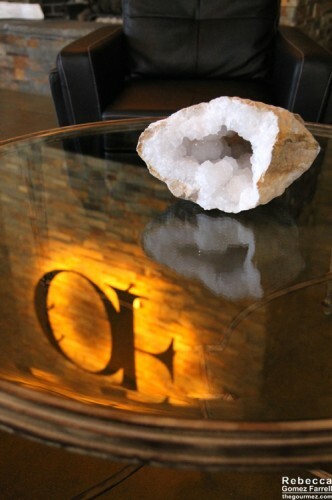 Oak Farms continues to set a standard that showcases the best of early California with future vision.